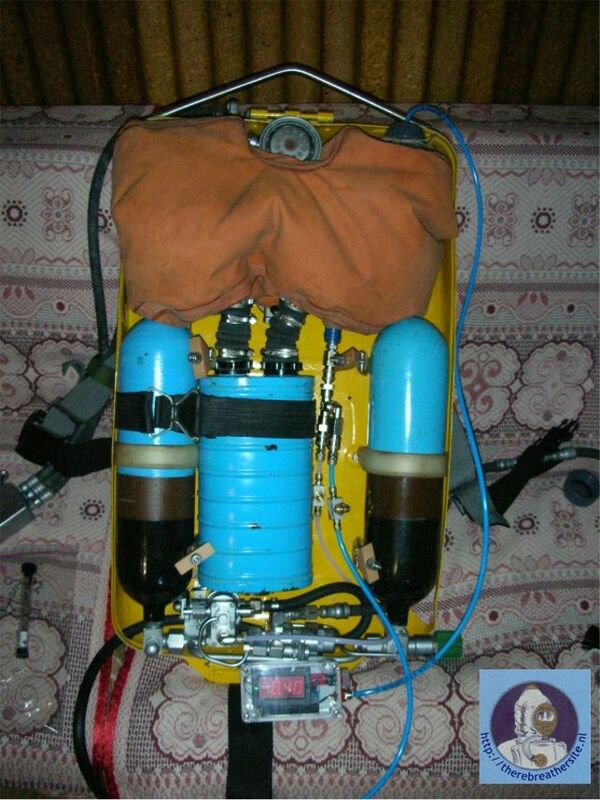 Alexey Stekolshikow (Алексей Стекольщиков) has informed me about a very special rebreather, the Russian IDA72V. IDA-72V is written IDA-72B in Russian. The IDA-72V is shown here. "V" stands for Vodyanoj meaning "water heated". 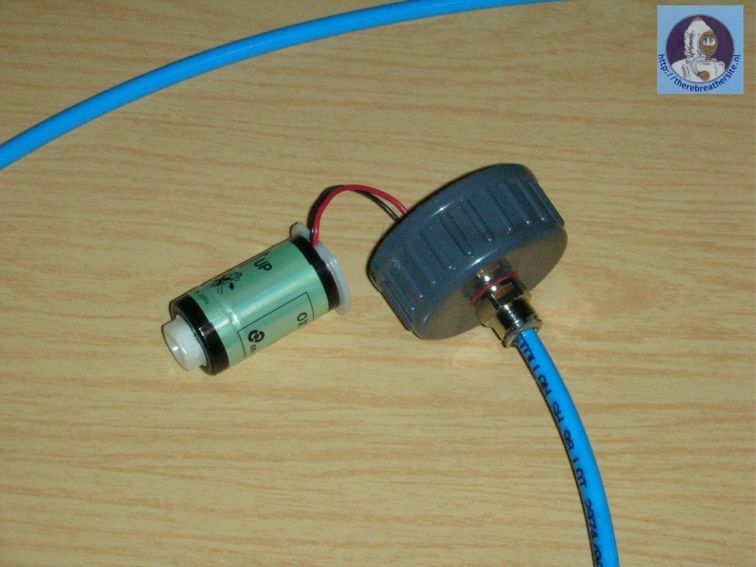 So the IDA72V is umbilical guided and dived unit supplied with hot water and probably gas. The bottles inside will offer redundancy. 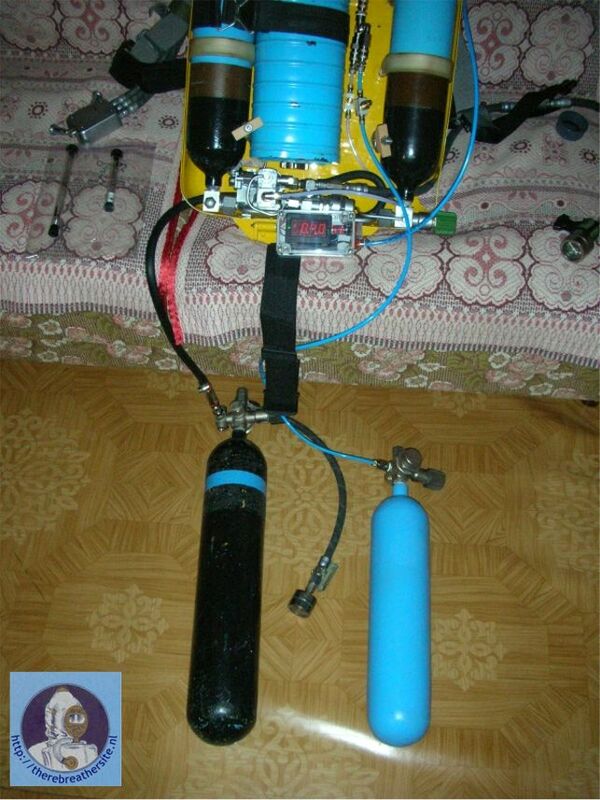 Alexey made his own recreational rebreather with the use of parts from different rebreathers. He used the IDA-72V as the donor unit and added parts of IDA-59 and KIP-8 rebreather. He then made his own oxygauge from single parts and finally finished the unit by making it work as an selfmixing semiclosed rebreather. Please follow the steps and information he provided. The unit has some unique aspects and is very nice to read. The unit has to be tested for now but all looks nice and well! Alexey, I am really proud you allowed me to share this information with all the readers from my web. If someone wants to get in contact with Alexey please don't hesitate to send an email! First stage - SCR conversion. 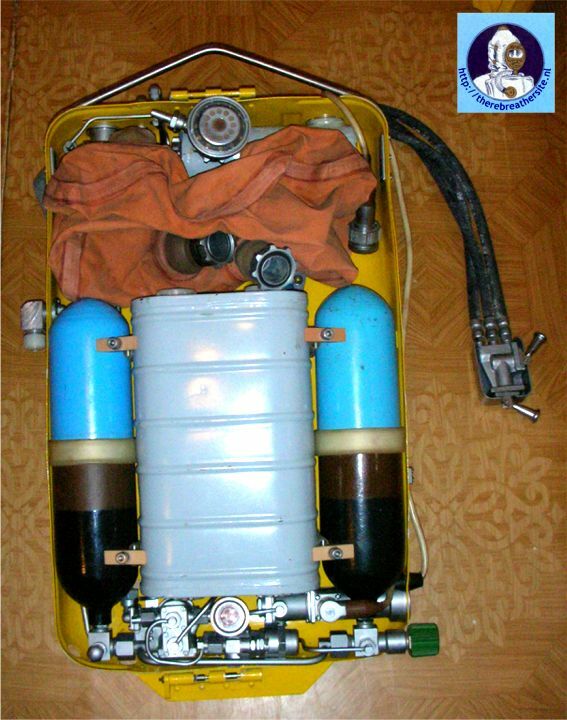 Due to excessive capacity of IDA-72 scrubber (5kg of absorbent) I want to use scrubber from other Russian military rebreather - IDA-59. It's capacity of 1,7kg I think was quiet adequate. It offers 140 minutes of diving time when filled with ХПИ. But, threading on IDA-59 scrubber was incompatible with IDA-72 breath bag : So I made some adapters. They are made from brass and chemically covered by nickel. 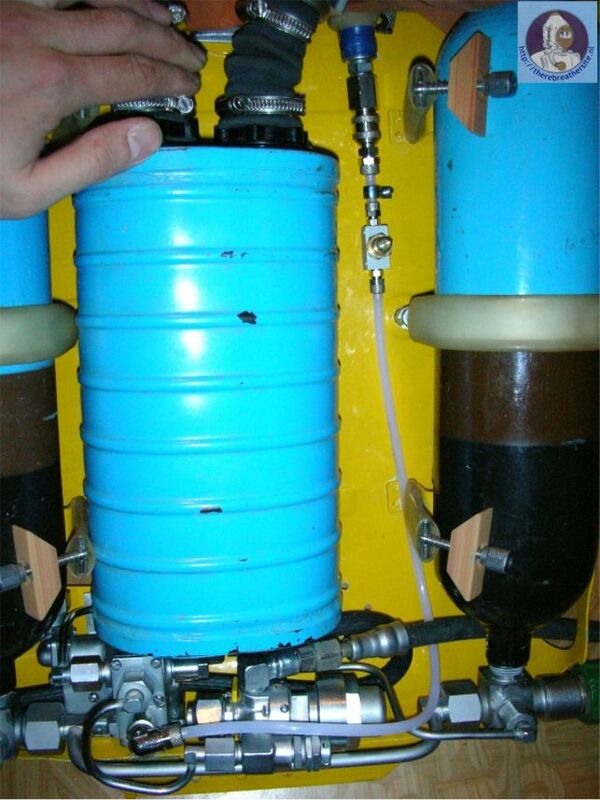 Here you see the IDA-59 scrubber with KIP-8 hose fittings. 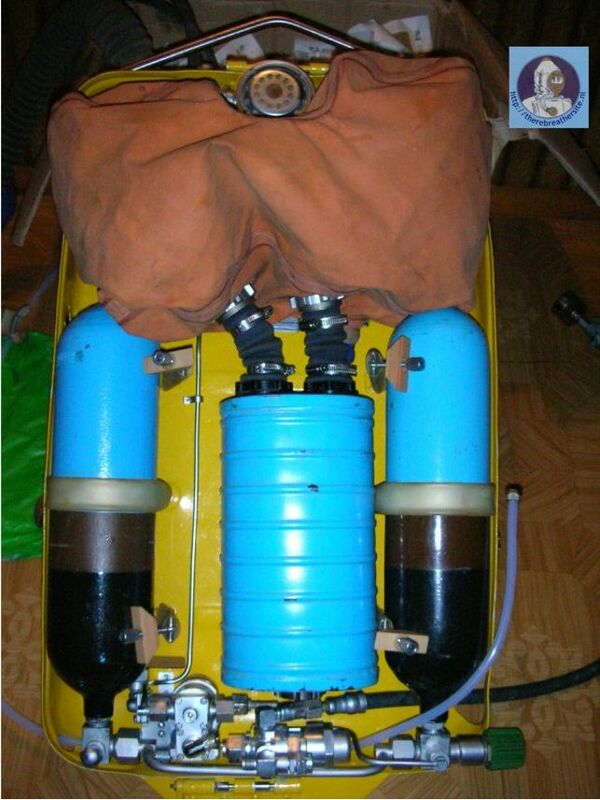 The Russian KIP-8 fire fighting rebreather is easily available and has same threads on it's hoses adaptors. Overall view with IDA-59 scrubber attached to IDA-72 breath bag via hand-made adapters. Here I removed the internally installed original CMF parts, because they provide different flows from different gas sources - 8...12 l/min from umbilical supply, and 4...7 l/min from internal supply. I made my own Constant Mass Flow valve with metering valves from Camozzi ( http://www.camozzi.com ) industrial pneumatic parts. Overall view with IDA-59 scrubber attached to IDA-72 breath bag via hand-made adapters, installed and calibrated CMF. Scrubber was fixed in place by rubber automotive spare wheel holder. 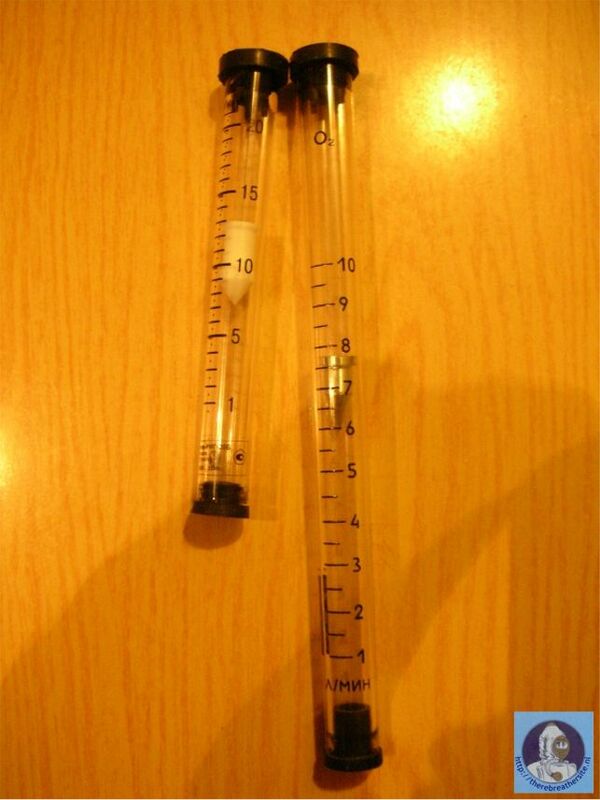 Here are two flowmeters from medical narcosis apparatus. Left - for Air 20 l/min, right - for Oxygen 10 l/min. I use them to calibrate and check CMF. 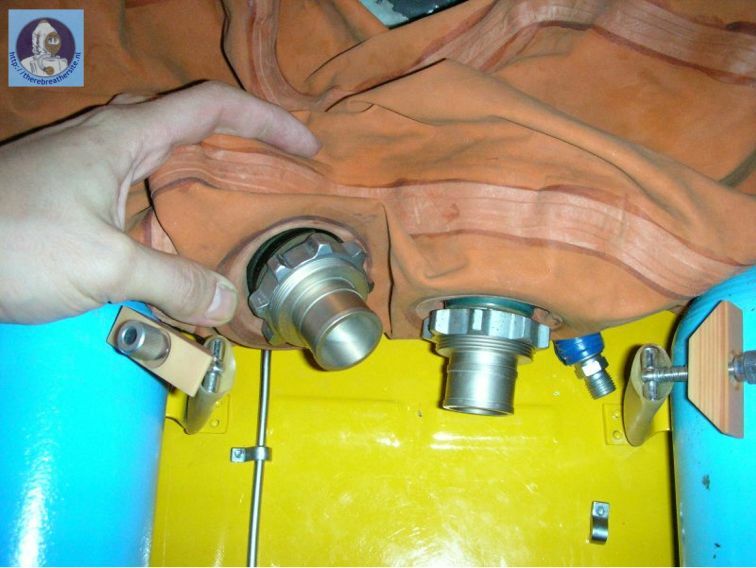 Second stage - Oxygen sensor. 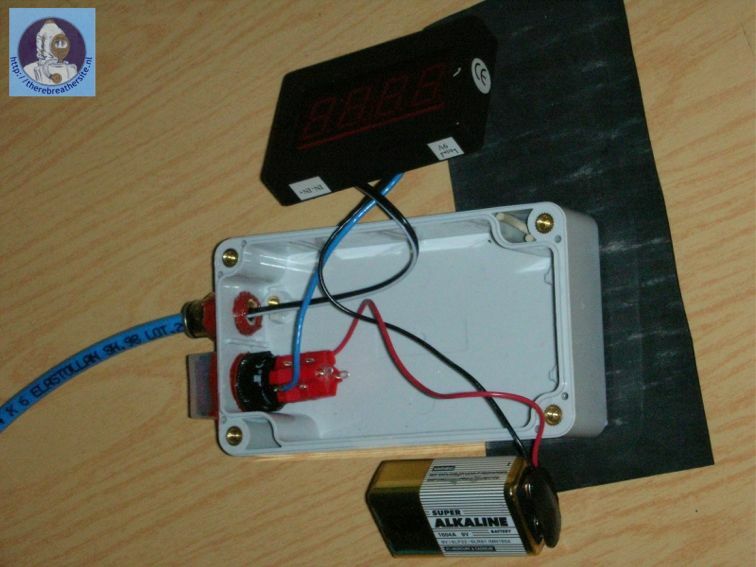 Due to my wish to get some additional safety in my rebreather, and troubles in buying Dräger Oxygauge or some of it's kind, I develop my own "oxygauge" system. It was successfully tested in a hyperchamber when I was tested to "Oxygen Toxicity". This was done by breathing by 100% oxygen at pressure 1,5ati (PPO2=2,5) in time of 90 minutes via oxygen mask. The Entire hyperchamber was pressurised by air, and a doctor that controls us do checks each 15 minutes. The sensor showed adequate readings, and fine predictable results - PPO2 was 0.21 on clean air, 0.52 pressurised by 1,5 bar air, 2,5 in oxygen mask and excellently seen result 0,21 at end of decompression. 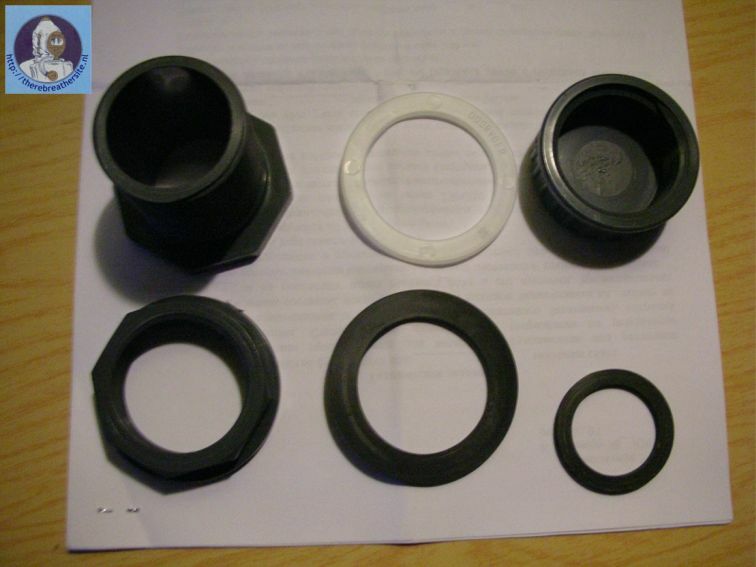 Sensor case parts were made from Van De Lande B.V. PVC fittings. Here you see the disassembled sensor case and case cover. 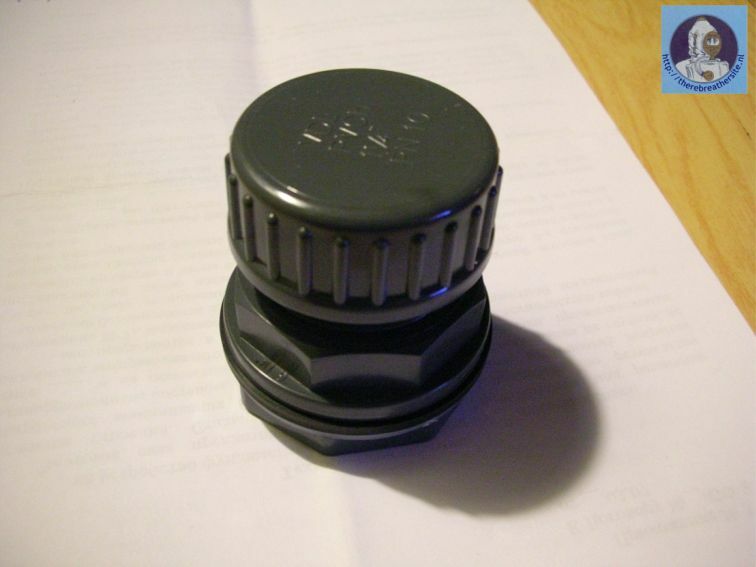 Assembled sensor case, case cap and case cap flat O-ring. The other side shows the sensor holder plate made in plastic. 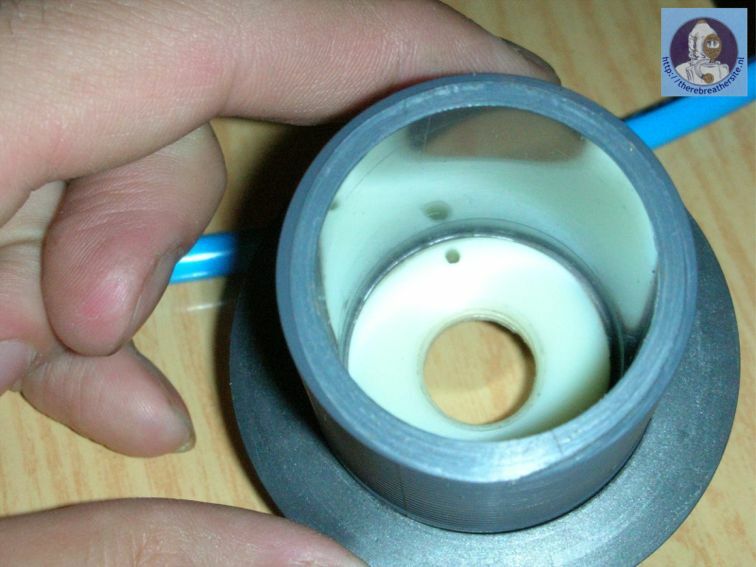 Clearly visible is the pressurisation hole on the left side in the thread. 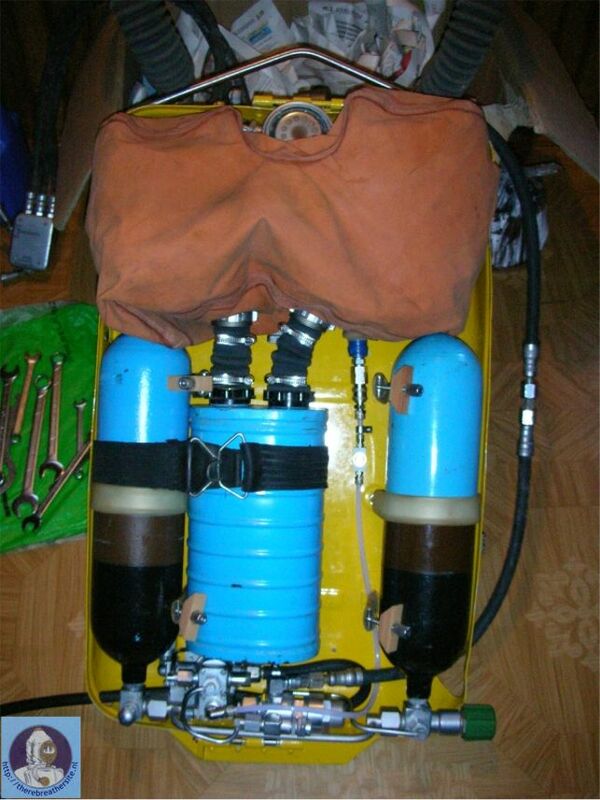 Special diving sensors are hard-to-obtain in Russia. So, I use available from dealer Figaro KE-25 sensor ( http://www.figaro.co.jp/en/make_html/item_2_sen_112280.html ). It was relatively not so fast (12 seconds to 90% of measured), but looks fine in practical testing. 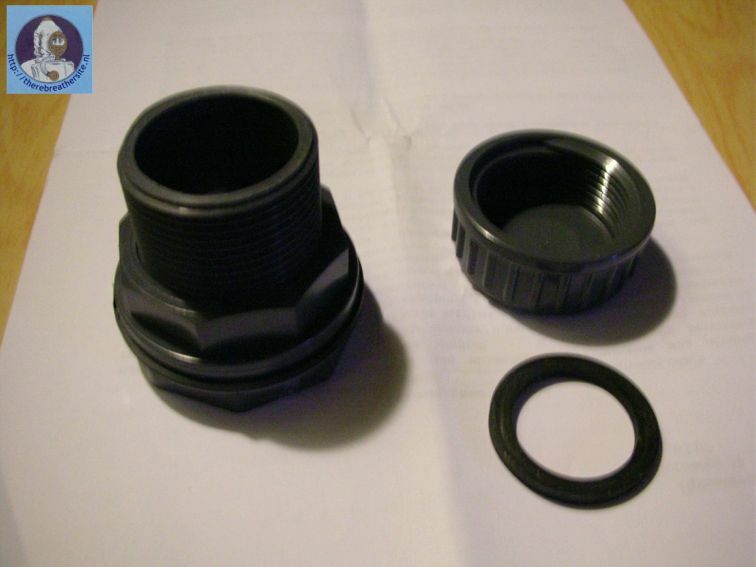 Sensor cap and wiring inlet. 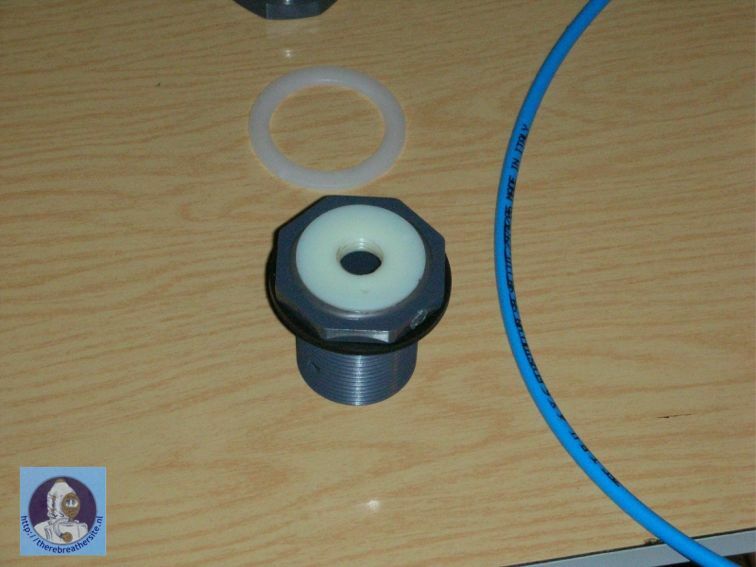 Wire was laid in Camozzi PVC hose, because i want to pressurise indicator box from breath bag. Display and it's box. 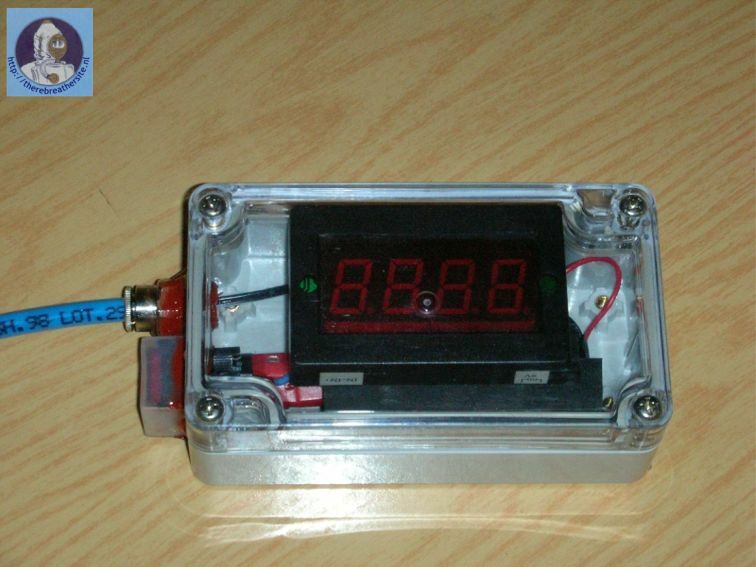 Digital read-out made by Velleman PM-LED, power supply by 9 volt alkaline battery 6LF22, due to supply current of PM-LED indicator - 60mA. Box - IP65 Gainta G203C ( www.gainta.com.tw ) Power switch - unknown, Chinese made, with rubber cap. 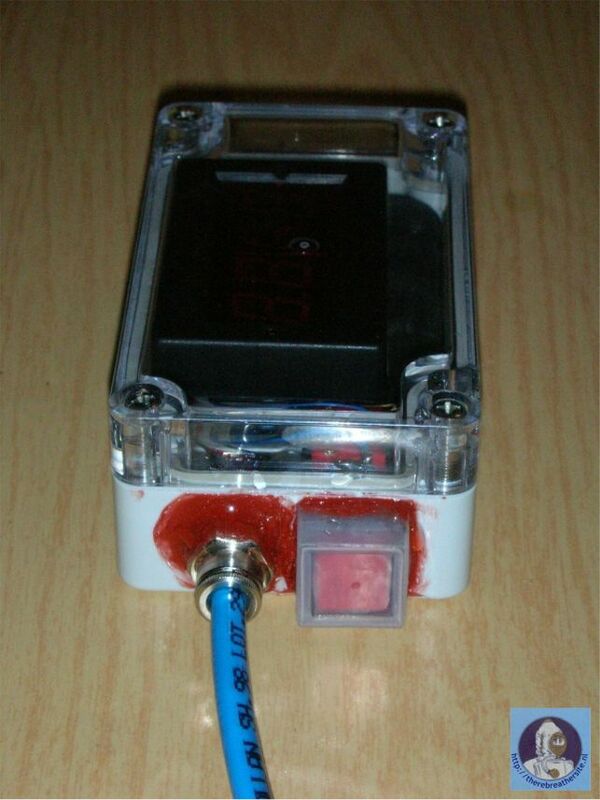 I checked the handset by placing it after the assembly into 0,5m deep water during 10 minutes. So, no leak in sight - job was done fine :) Quiet cheap device - overall cost .. less than $150. Nitrox was unavailable here in Russia, because ПВС-84 (Правила Водолазной Службы-84, PVS-84, Diving Service Rules by 1984 year), official naval diving rules, prohibits nitrox diving. Due to unavailability of Nitrox i try to develop some kind of Self-Mixing Gas - SCR. I think mixing in breath bag oxygen and air in proper amounts provide me nitrox. So, i test this. Two CMFs were set to 7.5 l/min air and 2.5 l/min oxygen, so by my opinion this must provide me with 10 l/min EAN40. After 3 minutes after opening the valves on oxygauge i see 0.40. Fine. So as scrubber was filled with sorbent, i doubly checks all parts, attachments, CMF settings, and so on. And 10 minutes of breathing by prepared in breath bag mix shows me that i breath by mix containing 33-34% of oxygen. No any signs of hypoxia or hyperoxia sighted. Now i wants to test this kind of rebreather in water, with support of my buddy, who goes on air-supplied OC. Clean view - rebreather, gas sources, oxygen sensor and flow meters. 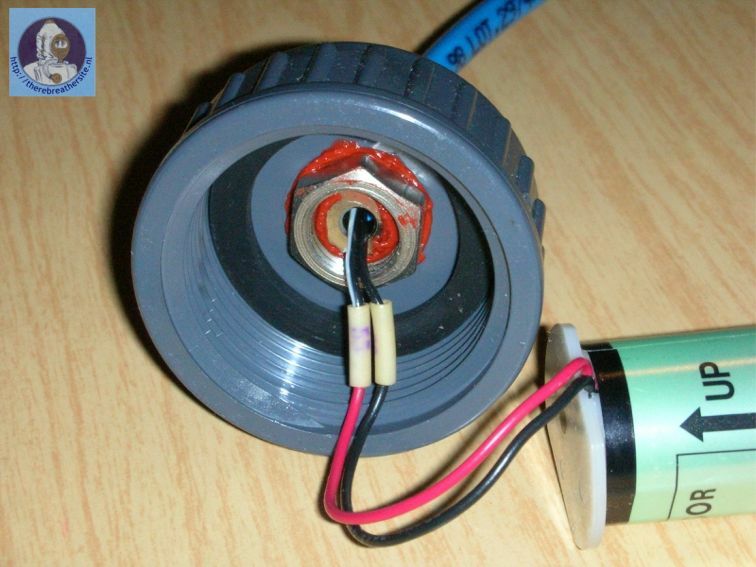 Clean view - mixer and CMF parts. All are bought from Camozzi. No internal gas sources were used in this test. I use two external cylinders - black with blue stripe, 4l/200ati with air, attached to umbilical supply port of IDA-72, and blue - 2,5l/200ati with oxygen, attached directly to oxygen CMF, which was set to 2,5 l/min. Both cylinders are fitted with integrated valve-reductors from IDA-59. Reductors (1st stages) are closed-stages, set to 10ati. To answer eventual questions about "why not to use 300bar cylinders and commercial 1st stages?" I would say that Russian 200ati cylinders and IDA-59 stages are quiet cost-effective. 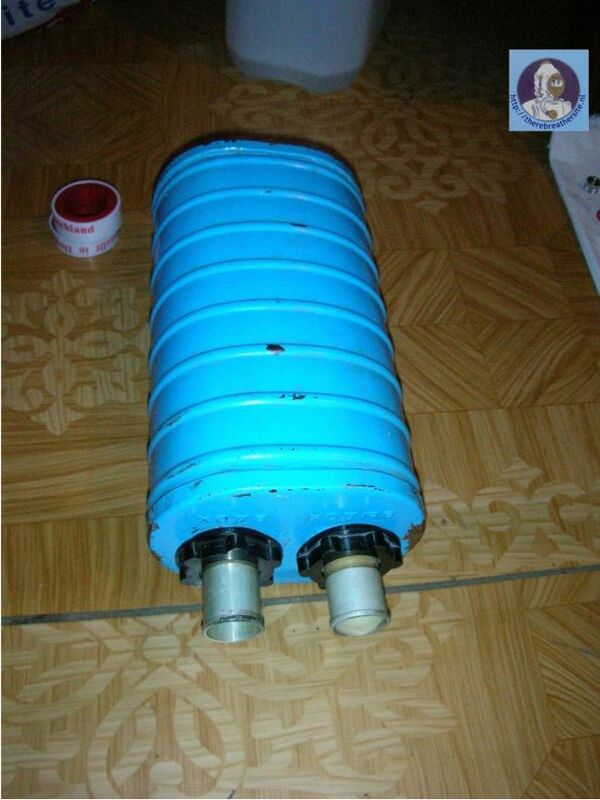 300bar 7l Faber cylinder cost here is about $200, and 1st stage cost is about $150. So, IDA-59 valve-stage cost was about $30 and 4l 200ati cylinder costs $40. So, internal 4l/200ati plus external 4l/200ati offers me 1600 litters of air, that was enough to at least 3 hours with 7,5 l/min feed. Also 2,5l 200ati O2 cylinder can feed me with oxygen up to 2,5 hours with 2,5 l/min feed. Enough to evaluation purposes? I think so enough ;) And also this was in balance with absorbent capacity, which was 140 minutes - 2 hours and 20 minutes so well. The original IDA-72V scrubber offers 400 minutes of diving time - very excessive time I think, 6,5 hours ;) This was best suited for mCCR, not for SCR.